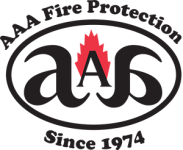 AAA Fire Protection Services helps local Richmond businesses improve fire safety, fire protection, and fire suppression. We have been in the fire protection and fire suppression industry for 40 years. We help small, medium and large sized businesses comply with local, state, and federal laws. We offer comprehensive services that began with the installation and maintenance of Ansul fire systems and provide industry specific fire protection. For example, we install and maintain paint booth fire systems for the automotive industry and systems that help suppress fires specifically designed for restaurants. We work with all industries and all businesses. AAA Fire Protection Services is equipped for emergency light installation, helping you create a safe environment in case there is a fire. In addition, our emergency light service is ongoing. We provide emergency light testing and when there are issues emergency light repair services. With over 40 years of fire protection services, we have become industry experts for all industries. We make it easy for local businesses to create a safe working environment, to decrease the risk of fire, to help contain and minimize damage in case of fire while helping you comply with governmental regulations.